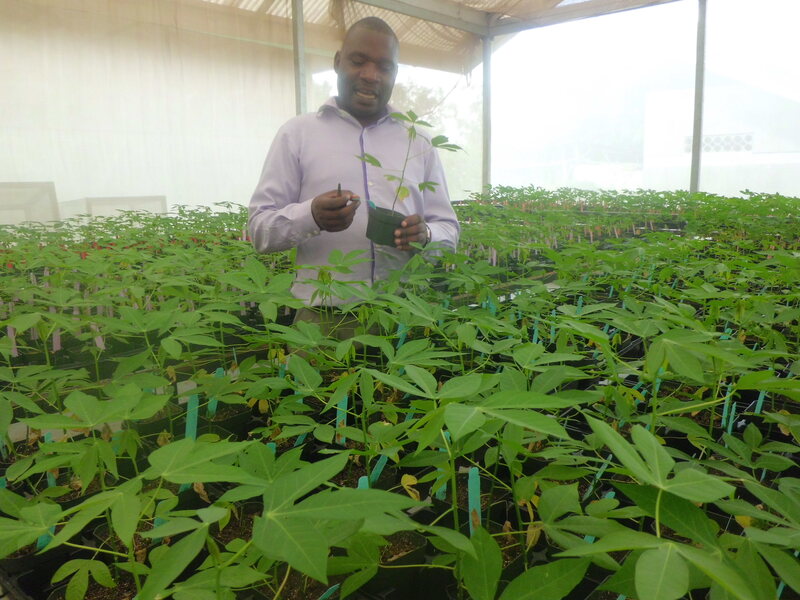 African researchers are optimistic that gene editing will help solve the continent’s plant breeding challenges, especially the infestation of cassava brown streak virus (CBSV) that is ravaging the crop in Uganda and other East African countries. John Odipio, a scientist with Uganda’s National Crop Resources Research Institute (NaCCRI) who is currently pursuing his PhD in gene editing at the Donald Danforth Plant Science Center in St. Louis, Missouri, is using CRISPR to understand genes in cassava that can help resist pests and diseases affecting the plant. Cassava is the third most important food crop in the tropics, comprising 30 to 50 percent of all calories consumed in sub-Saharan Africa. But yields have not increased in the past 25 years, due in large part to plant viruses that make the crop inedible. In explaining his research, Odipio noted that he obtained a gene in cassava and edited it to cause change in the color of cassava leaves. Gene editing is a very precise tool, which gives it an edge over the genetic modification methods previously employed to try and solve the challenge of CBSV, Odipio said. He has come up with an extract using CRISPR to help the plants resist the disease and fight off the white flies that spread the virus from plant to plant. Odipio has given his extracts to his NaCRRI colleagues, who are going to start the cassava breeding process using gene editing in their laboratory. Dr. Henry Wagaba, a NaCCRI expert on the gene silencing phenomena in plants, said a team of scientists are prepared to undertake research to understand if the technology can actually work in Uganda. The team is already in the process of securing an authorization permit from the National Council of Science and Technology, as required, and is set to start the research in February. Odipio’s research team in the United States is also willing to extend its knowledge to address key challenges affecting African cassava farmers, such as CBSV, cassava mosaic virus (CMV) and weed control. They have developed cassava varieties that can tolerate the application of herbicide, which will reduce the need for manual weeding often performed by women in Africa. They are also pursuing cassava varieties rich in quality starch that can be used in industrial applications and traded in the international market. Research is also under way on potential gene edited lines that flower early, thus shortening the breeding cycle and allowing scientists to deliver improved varieties to farmers more quickly. This will support timely development of climate resilient varieties. As this research progresses, Odipio is urging an update of African biosafety and regulatory systems in order to catch up with developments in scientific discoveries. He is optimistic that African countries will support a friendlier regulatory environment for agricultural products bred using advanced technologies, including gene editing. The regulatory framework for biotechnology varies from continent to continent and even country to country. The USA and Canada regard gene editing as equivalent to traditional breeding, while the European Union considers it akin to genetic modification. The main reason to subject organisms to regulatory oversight is safety, she wrote. Scientists have to dig deep into the concerns that form the basis for regulatory oversight in different countries in order to follow the fierce debate around the legal status of gene-edited crops. North and South American countries have paved the way for the development of gene-edited crops by removing regulatory uncertainty, Schmidt wrote. But the EU’s approach has raised concerns about the impacts on international trade. African countries have not yet taken a position on the regulatory framework of gene editing in the crop sector, said Arthur Makara, commissioner in charge of outreach at Uganda’s Ministry of Science, Technology and Innovation. But in the medical world, he noted, things are somehow different because products produced using gene editing are already in the market. Arthur Makara inspects transgenic cassava in a NaCRRI greenhouse. He is optimistic that regulations concerning gene editing will be approached on a case-by-case basis in African countries. The Ministry of Science, Technology and Innovations has started a benchmark discussion to consult other countries where gene editing is in advanced stages, including Brazil, Canada and the US, he said. This will guide Uganda in considering whether to draft a new regulatory framework for gene-edited products or amend the current GMO law to include aspects of regulating gene editing. Though GMOs have been the subject of intense opposition — much of it financed by groups in Europe — that has stalled their adoption in Africa, it’s unclear whether activists will have the same influence on gene editing.